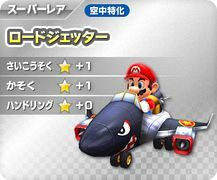 The Road Jetter is a kart that appears in Mario Kart Arcade GP DX. It grants the character a boost in both Speed and Acceleration; however, doesn't affect Handling. It's based on a Banzai Bill, and looks similar to both the Bullet Blaster and the Hurricane from Mario Kart: Double Dash!! and Mario Kart DS, respectively. The Road Jetter's alternate colors are blue and red; the former alternate's design is based off of a shark.